Every year starting in October, a very young Monique watched her mother make Halloween costumes for her siblings. She loved watching her measure, sew and embellish the many different fabrics. She would anxiously await the outcome and was always pleased with the result. When Monique was old enough, her mother finally let her help with the costumes. When the work was done, she found herself wanting to learn more so she enrolled in sewing classes in high school. And that was it – she was hooked and she knew then what she wanted to do. After graduation, Monique went on to study both graphic and fashion design. She participated in fashion shows where she had been the featured designer and sample sewer for several different companies who produce everything from clothing to headwear. 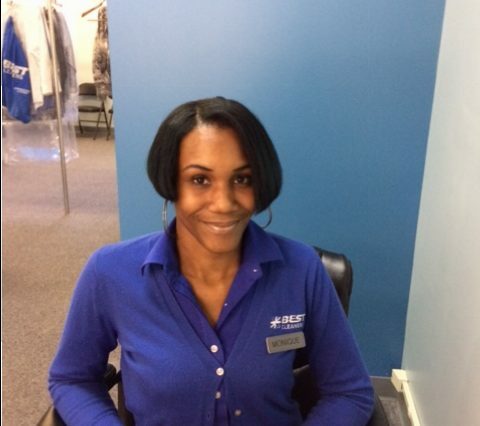 Currently, Monique is the full-time seamstress at our newest location in Simsbury and we feel very lucky to have her. From simple hems to full reconstruction, she has the knowledge and skill to do it all. Next time you’re in the area please be sure to say hi to Monique!